Where to put the video? The 2 minute 45 second video is 52 MB. I'm looking for some free online storage to host it. Does anyone know where I can get this hosted on a temporary or permanent basis? 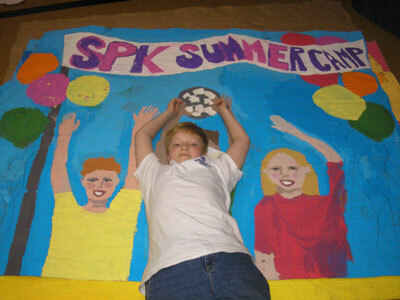 Like many kids, 11-year-old Joseph Sweeney spent most of his summer at day camp. But the camp he attends in The Bronx is different. All of the kids have Attention Deficit Hyperactivity Disorder, or ADHD. "Joseph is a very vibrant person," said his mom, Karin. "Very imaginative. Lives in his imagination sometimes. In fact, the camp is working on that. And he's unfocused a lot of the time. But he has so much energy that he can't sleep at night. He just goes and goes and goes. And it's very hard to get him to finish things and to do homework. "These are children who have a great deal of difficulty getting along with other kids, have very poor social skills," said Dr. Howard Abikoff of NYU’s Summer Program for Kids with ADHD. "It's hard for them to follow rules. They do poorly in school because it's hard for them to get their work done." OK. But how does summer camp help? Research shows that kids with ADHD respond to earning rewards for learning new skills. So at camp, they're awarded points and praise for appropriate behaviors, for reducing inappropriate ones and improving in areas they're having trouble with. Those points earn rewards such as a place on a field trip or maybe a movie on campus. It's run by the NYU Child Study Center and staffed by counselors who are psychology or education students. The camp's point system also helps children ages 7 to 11 develop social skills, and improve their academic performance in the classroom. "So this is an opportunity for children to really practice and learn and get better at a lot of the skills that they struggle with during the year," said Abikoff. "I think I’ve changed in my behavioral skills and my attention skills because I can't really keep someone's eye contact, as you can see," said Joseph. "But I’m more well-mannered and…I’m more attentive now." "His older brother and sister are out of the house now," said Joseph's mom, Karin. "So the whole dynamics have changed. So if he gets a lot more attention than he would have before. He's negotiating less. He always wanted to extend time, he wanted to get this, can I get this, can I get that. And now he's realizing that no is no and you have to live by the rules." Most importantly, kids continue their summertime gains throughout the year. "And I believe that one of the reasons is that they enter school on a different footing"” said Karen Fleiss of the NYU program. "They are feeling more positive about themselves, they've had a great summer, they feel like they can do things differently and better than they did in the past. Of course, then people respond to them differently because they're acting differently and behaving differently and they're more mindful of the things that get them into struggles and difficulties." Parents are also very involved with the camp, attending training sessions to continue the behavioral strategies at home. The camp is a little pricey: $8000 for eight weeks. But there are scholarships available to eligible families. For more information on the NYU Summer Program for Kids with ADHD, log on to their website. Wed. @ 5 p.m.: A special camp in Riverdale helps kids with Attention Deficit Hyperactivity Disorder conquer their difficulties. Neither he nor I have seen the segment. I wonder how much of his interview will be in the segment. I also hope that they put the segment into their video feed room. UPDATE: My son did an awesome job in the segment. My wife appeared in the segment as well. The news anchors Chuck and Darlene called my son cute and articulate. Laura Ingraham is sick and tired of it and so am I. They are men and women who volunteer. They are over 18. They are adults not children. The spin that those opposed to the war have in using children is that they lacked mature judgment. Members of the armed services have been calling to say they are insulted by being called children. The correct question is "Can you be a good scientist and disregard the evidence that the origin and development of life cannot be explained by random mutation and natural selection?" "One of the rules of science is, no miracles allowed," said Douglas H. Erwin, a paleobiologist at the Smithsonian Institution. "That's a fundamental presumption of what we do." What do you call the tornado that blows through a junkyard and assembles a Boeing 747? The appearance of biochemical machines that have been recently discovered are things where all the parts have to have been developed at the same time. Natural selection would not keep selecting incomplete versions of the clotting sequences. This contradiction is not being addressed head on, but Neo-Darwinists are distracting the public from awareness of the new challenges to Darwinism. There's an appeal to miracles (or more precisely, the Neo-Darwinists of the future) that someone will discover how incomplete biochemical mechanisms were selected. I think there's an Occam's Razor quality to saying design explains specified complexity and irreducible complexity better than random mutation and natural selection. Linking Intelligent Design with six day creationism. Saying that assuming the existence of God makes it not a science, while assuming the non-existence of God makes it a science. Linking ID to religion rather than to skepticism of random mutation and natural selection as explaining the origin of life. Denying history — the strong links between Darwin and his early advocates like Huxley with atheists like Marx and eugenicists. The natural impulse to believe in a higher power is now effectively blunted by "science" which imposes in elementary and high schools a fundamental philosophical system of materialism and mocks the idea that the natural order points to the existence of a supernatural order. On a rising sweep of land in rural Pennsylvania there is a remarkable testament to a family's gratitude. What was once a stretch of farmland is now a multimillion-dollar museum, chapel and memorial to Padre Pio, a Capuchin friar canonized as a saint in 2002 by Pope John Paul II. Revered as a great miracle worker of the 20th century, Padre Pio's following can be likened to that of Mother Teresa -- for his beatification, more than 22,000 people flocked to the shrine to give thanks. No sign of Masses being celebrated at the center so I'm guessing that the suspension of the celebration of Masses at the Center was not resolved. The Center has no canonical status and its appeal of the the decree of Bishop Cullen of Allentown was easily rejected. The bishop had demanded the board resign so that he could appoint a new board and institute new bylaws. Compliance with this would be impossible as the Center is not allowed this sort of restructuring without the permission of the bank who is the mortgage holder for the non-profit corporation.